Episode 1 SynopsisWith David and Shaw having just left in search of the Engineer homeworld, the fate of the Deacon is left unknown. This episode explores, emulates and compiles many of the fan theories involving the Deacon's fate while stranded on the desolate moon LV-223. New Episodes Every Month We will be unveiling new episodes for the Alien: Covenant Unofficial Animated Series every month! Each new episode will explore and bring to life other Prometheus and Alien: Covenant fan theories which have been shared on the Alien: Covenant forums. Get your theories featured in new episodes Share your own theories by starting a topic in the forums! Join us on Social Media Get updated when new episodes air, chat with our team and stay connected at all times, by liking us on Facebook, following us on Twitter and Instagram! Support the Artist Jason Cardona donates his time and resources to creating these episodes completely free of charge. Since this is non-profit, these episodes are also NOT monetized. However, you can help support him and his work by visiting is Patreon page. Any and all support will go towards furthering Jason's career and his abilities to provide high quality entertainment. You can help support Jason and his work, as well as maintaining equipment and software by visiting his Patreon Page HERE! Subscribe to our YouTube for moreSubscribe to the official Scified YouTube channel for more Alien: Covenant the Unofficial Animated Series videos and more! Learn more about this series Visit the Alien: Covenant The Unofficial Animated Series forum topic for information on this series. Ask the creators questions and share your feedback! Gallery Coming Soon...An image gallery for concept art and stills from this series will be available soon... Watch this space for updates! The Alien: Covenant Unofficial Animated Series is a strictly non-profit, fan appreciation initiative designed to immortalize fan speculation and theories based on the Prometheus and Alien motion pictures. The artwork created for these animated short films is exclusively created by resident forum member Centauri (Jason Cardona) and are inspired by the creatures and characters reflected in the Prometheus and Alien feature films. Images used are property of their respective owners. Alien: Covenant and its associated names, logos and images are property of 20th Century Fox and are in no way owned by Scified and its related entities. This is a fan-created website and fan-created production for the purpose of informing and exciting fans for Alien: Covenant's release. If you have any questions about this site, its content or the Scified Network in general, feel free to contact Scified directly. 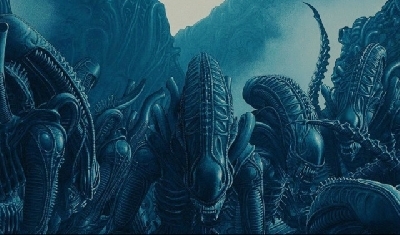 Alien-Covenant.com is an extension of the Alien and Predator Fandom on Scified.com and is part of the collective fansite network hosted by Scified. This website was built for the fans of Alien and Prometheus, by fans as a place to share news, opinions and theories for Alien: Covenant.